Some of the most consequential events of the Trump presidency will begin before Inauguration Day. On January 10, confirmation hearings begin for the President-elect’s key appointments. Senators, as representatives of the people, will exercise their Constitutional duty to “advise and consent” to the appointment of federal officers. As constituents of those senators, your attention and your input matter in this process. Hearings take place in the committee of jurisdiction. Those committee members are the ones who ask questions of the nominees. If the nomination passes out of the committee it then goes to a vote of the full Senate and takes a majority (51) to pass. Filibuster rules (requiring 60 votes in the Senate to proceed to a vote) do not apply for presidential nominees, except Supreme Court justices, because of a rule change by Democrats in 2013. The party makeup of the Senate (52 Republicans — 46 Democrats + 2 Independents who caucus with Democrats) makes it likely that most if not all nominees will receive the necessary 51 votes. In the case of a tie, the Vice President (in capacity as President of the Senate) casts the deciding vote. The math is tighter for Republicans before Inauguration Day, after which, VP-elect Mike Pence could cast a tie-breaking vote. 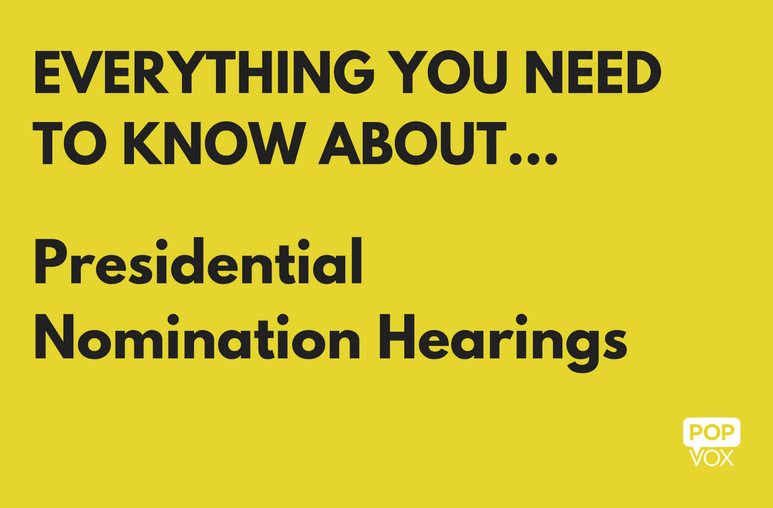 Nomination hearings are not just about the vote to approve or disapprove; they are a chance to get the nominees on the record and to find out how they view the various challenges specific to the departments or agencies they will lead. The hearings and floor discussions also give senators the opportunity to explain their own expectations and how they will conduct their duty of oversight. In our system of checks and balances, senators (and their colleagues in the House) hold a duty and power of oversight of the executive branch, and the power to direct agency actions, appropriate or withhold funds for agency activity, and the power to impeach federal officers in the case of misconduct. Hearings are an accountability benchmark and are even more powerful when it is clear that the people are paying attention. It’s one thing for a nominee to answer a question in a dark Senate hearing room on an obscure topic, knowing that the only thing that will emerge will be the made-for-tv sound byte. It is something quite different if it is clear that the American public is watching. How it will happen: Fast. Faster than ever. Paying attention to the hearings for Trump nominees is going to be difficult, however. The Senate has announced an expedited schedule that would make it physically impossible to watch all hearings as they happen. NINE nomination hearings are scheduled for the week of Janaury 9, and the pace is not set to slow. *Several hearings have been rescheduled. Jan 12, 10:30 AM ET: Secretary of Defense nominee, Ret. General James Mattis (Armed Services). The process is moving so quickly that for the first time in the forty-year history of the Office of Government Ethics, nominees will appear in hearings before completing the ethics review process. According to reports, the OGE has had a hard time getting information to begin the process. These financial disclosures have derailed nominees in the past. Notably, in 2009, former senate majority leader Tom Daschle was nominated by President Barack Obama as first Secretary of Health and Human Services. A a former senator up for consideration by colleagues in a Democrat-controlled Senate, Daschle was expected to cruise through the nomination process. However, a few weeks later, he withdrew his name from consideration after financial disclosures revealed $140,000 in unpaid back taxes. The questions and discussions in these public hearings will be the basis for the votes that come in the short-term and for the policymaking and oversight coming in the years ahead. As a constituent, your attention and your participation can impact the nominations process. What should you do to raise the bar for the nominees under consideration? The most important thing is to PAY ATTENTION. Watch, tweet, share, cover it in posts and articles, and just make it clear that people are watching. That will go a LONG way to hold both the nominees and the senators to a higher standard. If there is a particular question that you want to see asked, hashtag it, meme it, share like crazy and make sure you are writing to your own senator about it. Marci Harris is co-founder and CEO of POPVOX, an online platform for legislative information and civic engagement. Sign up for our weekly POPVOX updates on votes and happenings in Congress.